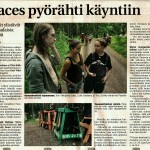 Here are two reviews of Lele Leles latest gig at Faces Etno Festival 2011 in Raseborg Finland. The first one is in Swedish: click HERE to read. And here is one for our finnish speaking fans! Doubleclick on the images to view them large. Once again BIG THANKS Faces! A review of the Loviisa gig for our finnish speaking fans by Loviisan Sanomat. 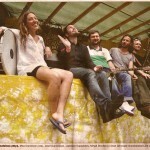 The self-titled collection by Lele Lele is an upbeat, energetic, and diverse collection of world tunes. Utilizing the heavenly sounds of the acoustic guitar and many native instruments, Lele Lele devises fluid, free-spirited tunes that are sure to leave lasting impressions. “En Magisk Hatt” starts things off right, wasting no time in acquainting listeners to the wide array of traditional instruments Lele Lele strategically orchestrates, as well as the vibrant and unique vocal performances. Taking on Middle-Eastern flair, “Zima” carries on the danceable mood of the CD while displaying some very memorable musical hooks. Furthermore, “Cogs & Gears” slows down the pace a bit while revealing a more emotional appeal to listeners. Superb production tops this assembly off, making it a prime choice for fans of world compositions.